This helps to avoid anyonyasraya i.e. reciprocal dependency. In this way this valuable text lays down the foundation of dvaita philosophy. It is hoped that the research students and the scholars who like to comparatively study the dvaita and advaita find this volume very useful. The first edition of this work was published in 1991 with the forward by Dr. Karl H. Potter. This forward is also included in this second edition. Professor of Philosophy, Washington University and Chief Editor, Encyclopaedia of Indian Philosophy We owe a vote of thanks to Professor Pandurangi for providing us with this elegant edition and translation of Madhva’s Visnutattvavinirnaya. In many ways this is the quintessential Madhva. It is in this text, more perhaps than in any other, that the great Dvaitin sets forth the central tenets of his faith. Although this is not the first translation of the work--it was translated by S.S. Raghavachar, also from Bangalore, in 1959-- it is the more satisfactory of the two. While the earlier translator was satisfied to provide the text and literal translation of each passage, the present treatment is far more generous, giving us bushels of useful comments to assist our understanding. These comments range from philosophical explanations of the relevant views opposing Madhva’s--almost invariably Advaitin-to insightful citations of relevant passages from commentators and from scripture. Especially helpful are the rubrics indicating the subject-matter of each section, in effect a Table of Contents, lacking in the previous translation. Inevitably as time progresses there is a need for new translations of important texts such as this one. English expressions which seemed natural and clear at one time lose their cogency in a later period. Furthermore, there has over the decades, arisen a greater scholarly tolerance for “looser,” i.e., more natural and colloquial, translation. The present rendition provided by Prof. Pandurangi is a fine example of such a style. The translator is fully conversant with the nuances of the style found in works of this nature and tradition. He has done us a signal service in providing such an illuminating rendition. 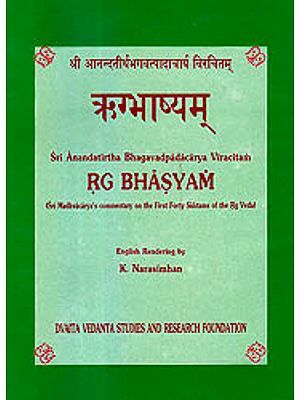 Visnutattvavinirnaya is one of the ten Prakaranas i.e., compendiums written by Sri Madhvacharya alias Anandatirtha the founder of the Dvaita School of Vedanta. It is a major Prakarana while the other nine are comparatively small. Sri. Madhvacharya flourished during the thirteenth Century. Udupi District of Karnataka, was the centre of his activity. 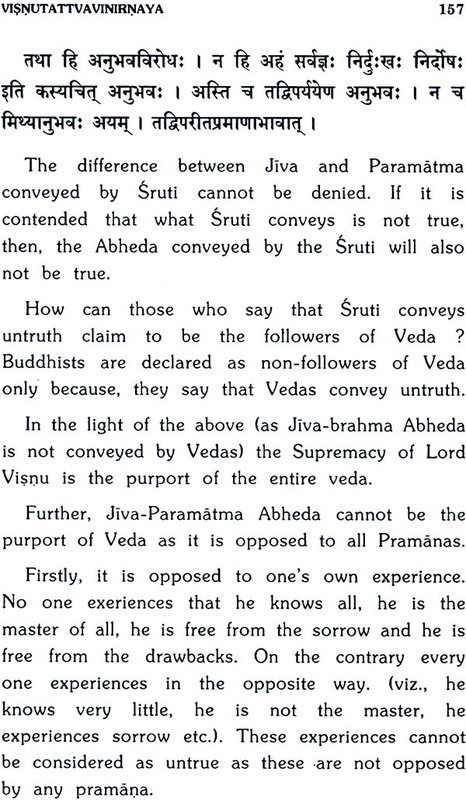 He opposed the Advaita Vedanta of Sri Sankara and wrote Bhasya on the Upanisads, Brahmasutras and Bhagavad-Gita. He also wrote a Bhasya on the first forty hymns of the Rgveda, prepared a critical digest of the Mahabharata called Mahabharata Tatparyanirnaya, a Work on Worship viz. 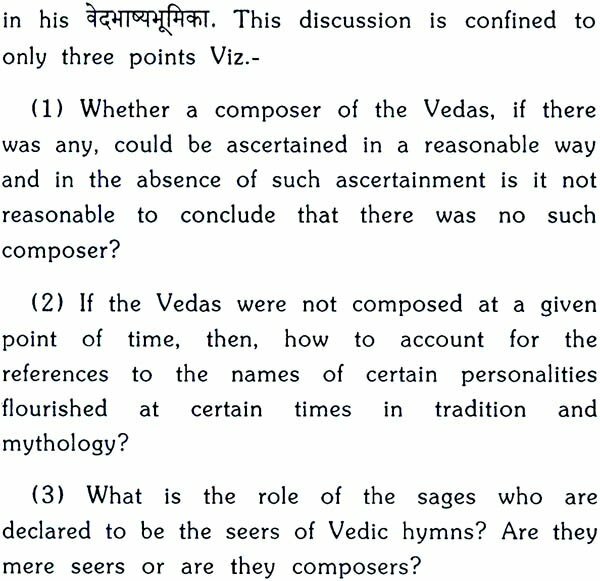 Tantrasara Sangraha, a brief commentary on the Bhagavata, Viz. 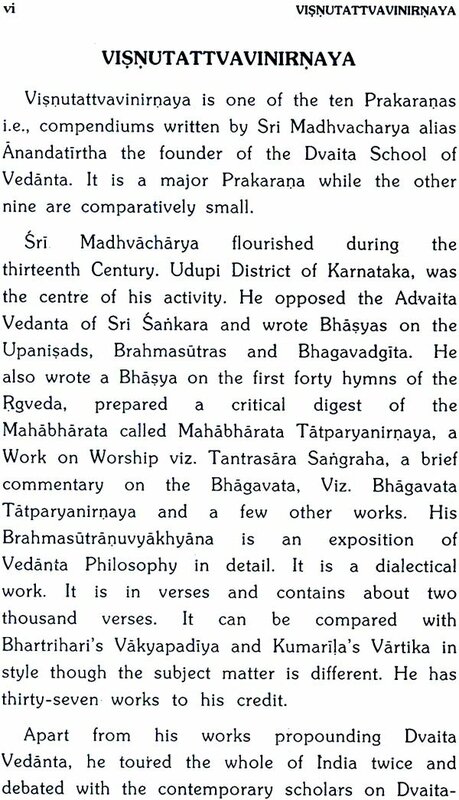 Bhagavata Tatparyanirnaya and a few other works. 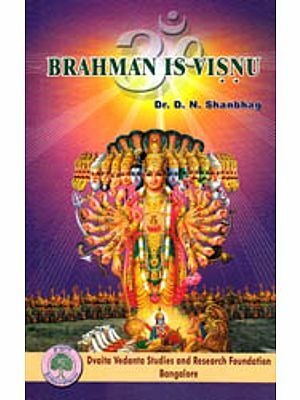 His Brahmasutranuvyakhyana is an exposition of Vedanta Philosophy in detail. It is a dialectical work. It is in verses and contains about two thousand verses. 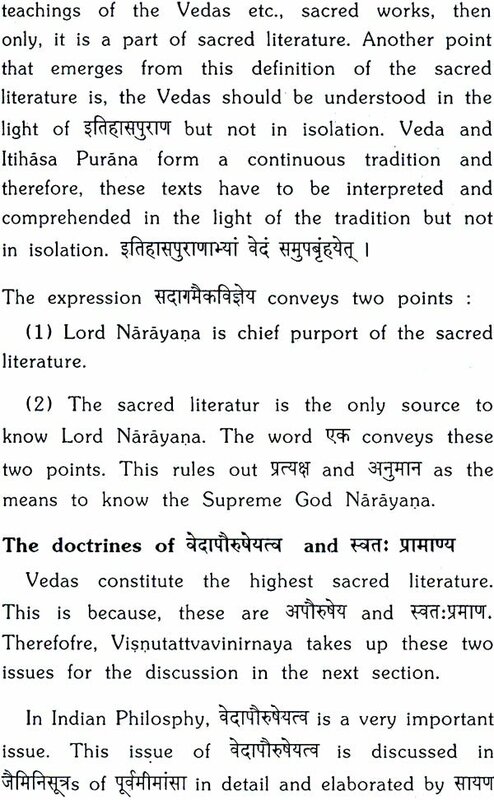 It can be compared with Bhartrihari’s Vakyapadiya and Kumarila’s Vartika in style though the subject matter is different. He has thirty-seven works to his credit. Apart from his works propounding Dvaita Vedanta, he toured the whole of India twice and debated with the contemporary scholars on Dvaita Advaita dialectical issues. He converted many to his faith. King Mahadeva of Yadava dynasty met him and paid his respects. A Court-Scholar of this king, viz. 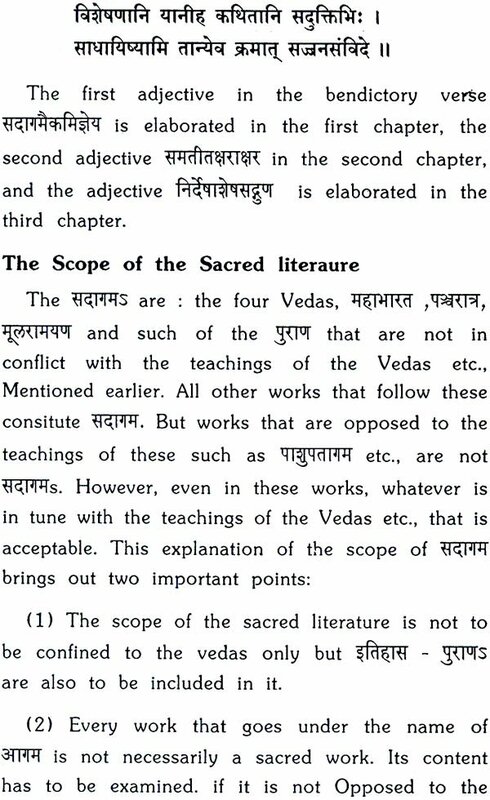 Sobhanabhatta alias Anada bhatta became Sri Madhvacharya’s disciple. He was ordained to Sannyasa. He was named as Padmanabhatirtha. He later went to the famous Vijayanagar region and did the spadework for the establishment of Vijayanagar empire. Another disciple of Sri Madhvacharya, viz, Naraharitirtha was the regent of Kalinga country. Sri Madhvacharya established a Krishna Temple at Udupi and oradined eight Brahmacharins to sannyasa. The eight Mathas of these still continue as great centres of learning and culture. 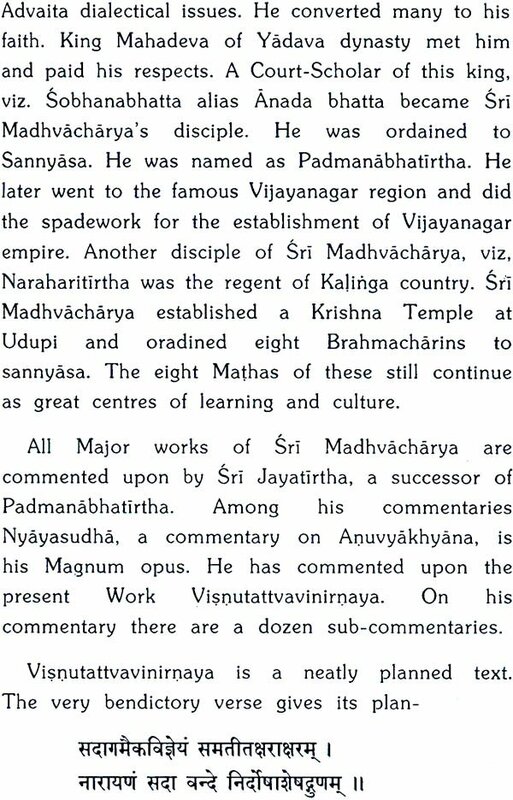 All Major works of Sri Madhvacharya are commented upon by Sri Jayatirtha, a successor of Padmanabhatirtha. 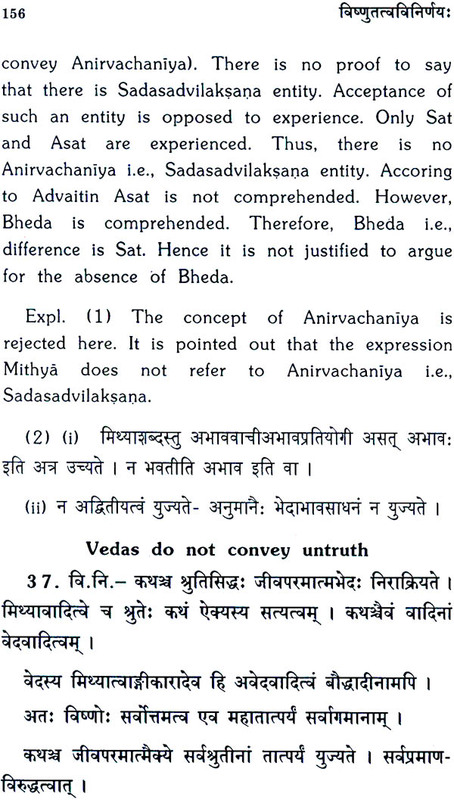 Among his commentaries Nyayasudha, a commentary on Auvyakhyana, is his Magnum opus. He has commented upon the present Work Visnutattvaviniroaya. On his commentary there are a dozen sub-commentaries.